Oh, for Pelor's sake... What are we even looking at, here? "Claws flash as it cartwheels end over end on five furred legs," the fluff text reads. The Roving Mauler is a 5-foot tall starfish with lion legs and a lion head on either side of its ridiculous body. The combat description even explicitly states that it has sharp teeth, but it can't attack with them. The creators took what is arguably the proudest animal known to man and made it into a rolling joke. I would kill this monster on sight out of sympathy. How to use it: The Roving Mauler is based on Buer, a goetic spirit from a 16th century demonomicon. Buer is described as a "Great President of Hell," presiding over fifty legions of demons, and while the D&D version of Buer presented in Tome of Magic retains some of the historical lore, the essence of Buer is lost. 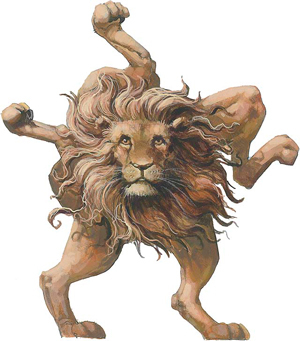 Playing closer to the original lore may be the key to saving this creature - rather than some magical, crippled lion living in the wild, make the Roving Maulers in your campaigns fiercely intelligent demons with the capacity to speak, breathe fire, and possess other clearly supernatural abilities that better match its shape.